We were still exchanging funny comments. We didn't know that the disaster was just starting. According to him, when he entered his comment made at 10:53 am, the flood waters came rushing in. He did not even have time to shut the computer properly. He just pulled the plugs and carried the CPU, monitor, and printer and placed it in the topmost shelf of his bedroom cabinet. That was also the same time when power went out and I was convinced that it was serious. After an hour he calls me up via his wireless landline phone and informs me that the house is submerged in neck-high flood water. He said that him and my brother-in-law were on top of my dad's Toyota Hilux. Thank goodness that the garage was on higher ground. They would have probably went up to the roof if the car wasn't there. My sister was taking her IELTS exam in Ortigas that day and she wasn't around. I found it unbelievable at first because there was no flooding inside our village. A few moments later, the househelp calls my attention while standing in our second floor veranda. There I saw the village behind ours submerged in flood water. We tried to drive the car to the nearest supermarket to buy supplies but the flood outside the village gate was high too. My husband and houseboy ended up walking through the waist-deep flood just so we can get some food, candles, water, batteries, and my son's medicine. While they were away, I hauled food from our pantry to my son's room upstairs. I was sleepless that unforgettable Saturday night. 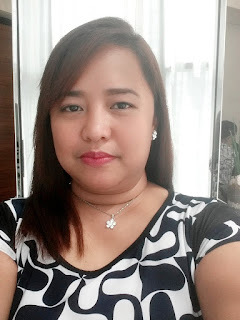 Aside from thinking about the situation of my brother and brother-in-law in Vista Verde, I was also worried about my sister who was stranded in SM Megamall, my parents who were in Greenwoods, San Andres, Cainta, and my nephew who was with my brother's in-laws in Doña Petra in Marikina City. I stayed up all night waiting for updates over the radio and for messages sent to my phone. My sister was the first one to send me an SMS that she made it to her in-laws' place in Cubao. My parents' place was submerged in waist-deep flood water but the house was not flooded. Up to now, we still do not have news about the whereabouts of my nephew but we received the good news that he and his grandmother were rescued from the roof their home. We just need to know where he is staying right now. 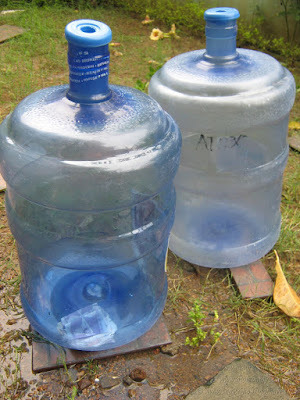 The following morning, I was thankful to see my brother and brother-in-law walking towards our place, each of them with a 5-gallon bottle of water. As it turned out, they swam the flooded Imelda Avenue using the water bottle as a life saver. They swam for two hours to reach us even though we were just one barangay away. 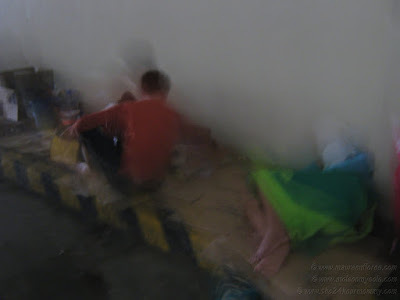 They were so hungry from spending the night without food and water. That Sunday afternoon, my husband and I walked through the flood to buy food in the public market. These are just some of the depressing scenes I saw along the way. Now I know how Noah must have felt during the great flood. 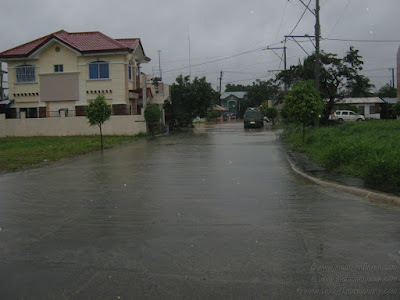 News reports said that 95% of Cainta was under water. I guess we are the remaining 5% of the town's population who stayed dry that night. I had mixed emotions thanking the Lord that He saved us and our belongings from the flood. However, I also felt sad for the people who were affected by it. My sister and brother, for instance, were not able to save their furniture and electric appliances. Their clothes are now all wet and muddy. At least, it is still a consolation to know that everyone is safe. Material possessions can always be replaced, anyway. But you can never bring back a lost family member. The waters have subsided in most parts of our town but we haven't fully recovered yet. Food and drinking water is still scarce. 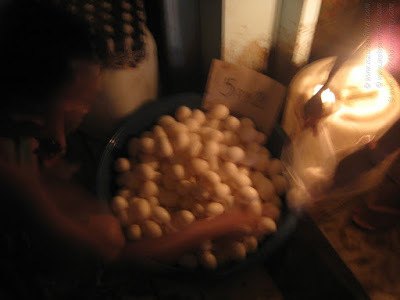 In fact, we needed to go to Quezon City just to be able to buy more food and drinking water. My hopes are still high, though. We'll get by and things will be better one day at a time. 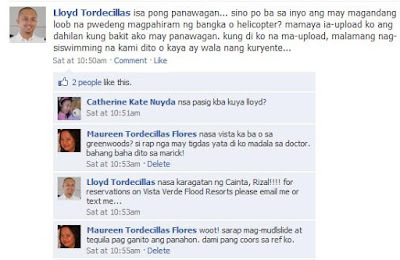 i lived in cainta (vista verde to be exact) for a year back in 2001. 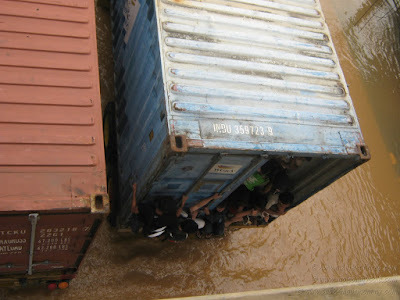 We experienced flooding but never like this. glad yer safe. have you got news on yer nephew? Hugs to you mauie. And I will keep praying with you for your nephew. All of us who are spared from the flood must now help those in need. 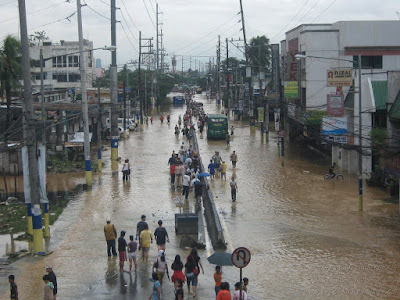 I live in Caloocan and flood during rainy season is just normal. But this time, it's so bad that even areas not affected by flood experienced it. my thoughts and prayers go out to you and your family Mauie. I'm glad that your family is safe from harm. I hope and pray that your nephew and his family are safe as well. God bless. Thank God you are all safe. May God's mercy be upon us all. Hi Maui, I am one of those who were praying for your safety and posting for you to be rescued. I am too glad to know you and your family are safe.